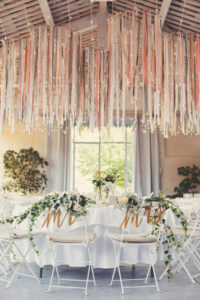 With a little time, some tape, and a hula hoop, simple streamers can make a big impact. We found this example and easy to follow instructions courtesy of Natalie’s blog at home with Natalie. This is an easy way to draw attention to a specific space. 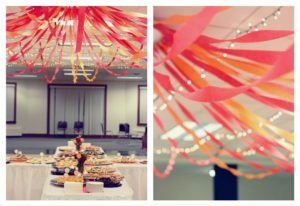 Frame the buffet table or gift table by adding ceiling-to-floor streamers along a wall. Check out this tutorial via Lovely Indeed. 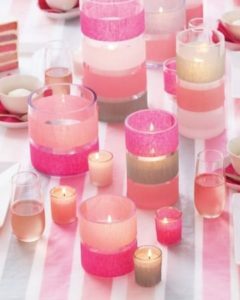 With just a little double-sided tape and the candle holders you have on hand, this easy DIY will create instant fun and stylish centerpieces. Courtesy of Martha Stewart weddings. This detail can be as simple or as complex as you want. Try a simple design by laying alternating colors along the center of a table. Or try a more complex design by weaving coordinating colors in a basketweave pattern to create a more intricate design. See examples here by Kim via her blog. This beautiful decoration looks more intricate than it is. This is a simple way to really add a WOW factor to the room. We love the look created above for a wedding, shown here at Style Me Pretty. 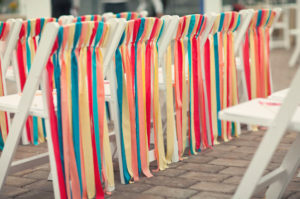 Another fun way to add flair is to simply tie or tape streamers to the back of chairs. You can do this with just the Bride-to-Be’s “throne”, or choose every chair! This example courtesy of Green Wedding Shoes.